Textkernel organised the international conference Intelligent Machines and the Future of Recruitment in Amsterdam. One of the speakers was Perry Timms, Founder & Director of PTHR. In this blog post, Perry explains about what robotics, automation, machine learning and AI means for the world of work, jobs and human endeavours. There is a certain technophobia present in HR. Often HR professionals do not get the technology that’s being used. Being tech savvy nowadays means more than having a self-service cloud-based HR system. That’s low level labour realignment and marginal process improvement. My fear ­as an HR professional who is being aware of and experimenting with technology constantly is that my profession is already way behind the curve. So how will HR practitioners cope with the latest array of digital disruption? 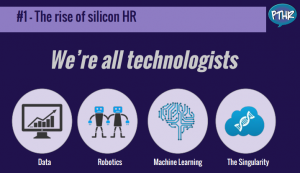 HR and also other business functions should not deny any longer that ‘we’re all technologists’. Denying this fact would be equal to saying music is only for composers. HR professionals need to understand artificial intelligence and also what the data is telling us. For multiple areas of business the likelihood of success is measured by the application of data analysis. In order to get HR up to speed it is important to deliver programmes of change that highlight the shift in the digital world of work. I’m delivering a module on technology which looks across the landscape of technology as part of a programme which fuses traditional HR practice with this tech bolt­on. There are MOOCs, social networks, communities of interest and learning groups ­if HR professionals want to know more about AI they have to join communities and groups that already exist. HR professionals should browse, graze and activate their interests in this area. Organization Development is a field of practice in HR which also included Organisation Design. This field includes way more than the creation of an organizational chart. 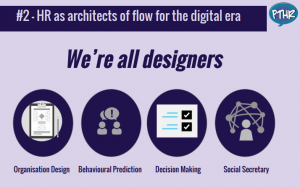 It’s the organisational equivalent of designing a complex adaptive system like a rainforest eco­system. Sandy Pentland, Director of MIT Media Lab’s Human Dynamics Lab, is probably the least known HR architect and designer there is. Singularity U referred to him as the “builder of a society enabled by big data and shows how to scientifically understand human interaction”. Pentland asks the question “how can we design organisations and government that are cooperative, productive and creative?” He hypothesized that human behaviour is much more predictable than we previously thought. Pentland has analysed employee interaction and communication and found the weakest link in the chain was us, people. Bad decisions, delays came from people not knowing enough and/or having access to the best information. So it’s not us per se but our interactions with each other and the systems. So the problem is not ‘machine ­to ­machine’ but ‘machine­ to human’. That’s also the junction HR needs to be most focused. Artificial Intelligence will feel most useful at this segway. As Pentland says “I don’t think of them as intelligent, self­ aware computers. I think of them as social secretaries.” It’s vital that HR has an understanding of what this means to work, the skills people need and the way to leverage this new form of interaction. I wonder how many HR professionals are working up their awareness of AI and machine learning right now? We need to see more experimentation showcases as well as some pioneers talking more about this. We need to get something like an HR version of Singularity U. That’s an area I’m about to start collaborating with a technology company to bring a virtual learning space together for this activity. Furthermore, I’m approaching the Future of Life Institute on their work and looking at an HR faculty within their work. Facebook feed analysis as the social network analysis tool. Nominating yourself to work with an enterprise you admire, believe in, want experience with. 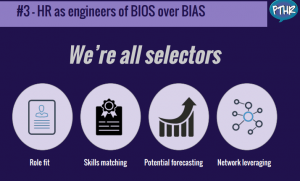 Selection via algorithm into roles that are most suited to you. Like an automated version of Upwork or GitHub. Where these don’t apply, and you are in an enterprise that needs someone with something, you’ll use your network and acquire (short or long term). In order to succeed in this endeavour we need to engage engineers; be bold in our research and intelligence gathering in this area and go into this with ours eyes wide open and our receptiveness primed. Of course HR will also have a large part to play in redeployment and skills shifting needed when AI replaces large numbers of insurance claim advisers; lawyers; wealth managers and even educators where decisions can be automated based on data analysis and machine learning. IPSoft’s Amelia is a prime example of a semantic memory; sentiment analysis to read and understand emotions and learn from human interaction where the AI databank has a gap. What does this mean to the traditional view that people learned at lower end jobs and progressed? This is where HR needs to pivot and adapt. There will probably be a strengthened need for mentoring. Possibly where people are matched to others through AI. Careers will need designing and learning will become work. Learning, something we squeeze in between doing, ­will become a key factor in where we work and what we do. Learning like this will be the leverage for the employee proposition. Work problems may well be solved by people looking to join the company as well as those already in the company. We could see not simulations but real situations as selection and career development opportunities for people. Al will help us manage the flow of people, problems, projects to purpose. Artificial intelligence will help us with the added power to achieve the triple bottom line of economic viability and rebuild the planet. Perry Timms is known for his energy, passion and insight around the world of people and work. He is a Chartered Member of the CIPD; and Visiting Fellow at Sheffield Hallam Business School. Skilled as a facilitator, coach and mentor Perry is qualified in change and a range of psychometric tools and has been leading on business improvement and change for over 20 years. 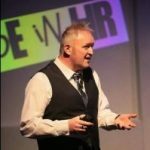 Perry is Vice Chair of the Northamptonshire CIPD Branch, and also lectures on HRM at Birmingham City, Westminster and Dublin City Universities. 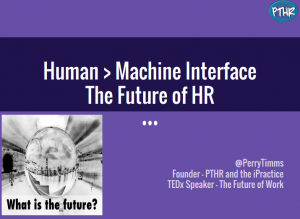 Having held corporate roles as Head of Learning, Talent & OD in public and not-for-profit sectors, Perry has set up his own enterprise – PTHR(People & Transformational HR) delivering Perry’s aim – to change the world of work; one conversation at a time. Perry is a social HR Practitioner as he tweets, blogs and is active on LinkedIn and was voted 7th in People Management magazine’s Top 20 HR power-tweeters for 2012 and one of top the top 10 HR Bloggers in the 2013 update.